One of the main attractions to the Islands of Puerto Rico is the tropical humid forest of El Yunque. Declared a U.S. National Forest in the 20 Century (because PR is a US Territory), its legal name is El Yunque Caribbean National Forest. But local people known its as El Yunque. For that reason you will find the US Forest Service as the administrative in charge of. The west side of the Big Island of Puerto Rico is full of surfer life. As the towns of Rinc√≥n, Aguadilla and Isabela has the best surfer spots in all the Archipelago, as the Atlantic Ocean is on their respective shores with big waves, here is the place were you will find a lot of continentals enjoying beach life or moved for a season and living place. The northeast side of the Archipelago is full of beach life. Different from the west side of the Big Island, the north east likes peaceful beaches with less surf. 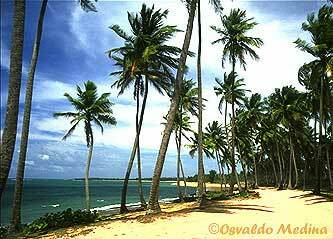 Here you will find Loiza, R√≠o Grande and Luqillo well known beaches by locals.